What it's really like to have a pot-bellied pig as a pet. It's summer in Ramsay and I'm on the front porch reading when a little girl and her dad walk by. They get a few steps past the house when I hear “A pig lives in that house”. “Is that right?” her sceptical dad responds. “Yep”. A pig does live in this house. Yes, sort of like a dog but different. Why did you get one? I wish I could answer that. It might be because I saw one on a leash as kid, or because I love their cute little faces, or maybe just because I wanted to be different. It all started at the wise old age of 24 when I googled "How to keep a pot-bellied pig as a pet". The articles were very helpful, and painted an easy life with a smart, obedient and charming pet. 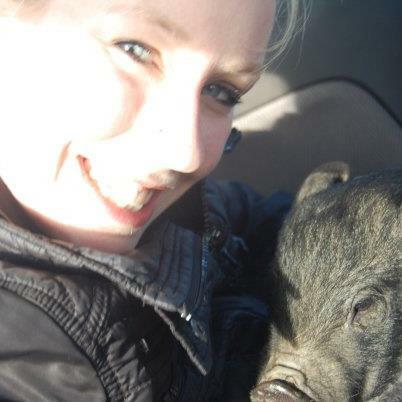 Filled with confidence in my pet-parent ability, I did what anyone would do; I drove to an exotic animal auction in Olds, Alberta with Georgia and bid on a baby pig while my boyfriend waited in the car. The baby pot-bellied pigs were grunting, groaning, and screaming. I ignored their 200 lb counterparts in the next stall, telling myself they were a different breed. We had never been to a farm auction before, but we got a number and sat in the risers with everyone else. The pigs were ushered out, so cute, and any hesitation I once possessed, went out the window. Georgia knew. She raised our number, and no one else bid against us, so in a split second pig #7 was ours for $40.00. 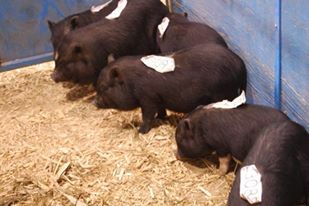 In the waiting stall were 12 little pigs with numbers glued on their sides running around biting eachother. Unsure of how to get my little # 7 pig out I asked the closest teenager in farm clothes for help. He found a box, hopped in the stall and picked up #7; the scream was unlike anything I'd ever heard before. As I approached the car with my pig in a box, Ryan put out his cigarette and shook his head. The pig was very frightened and immediately went to the bathroom. We ditched the poo box in the parking lot and I held him in my arms the whole way home. Pigs eat smells. Mickey chomps at the air when something smells good or bad. They can run super fast, like videogame fast. See here. Not only do they snort, they also bark (when displeased) and wolf (when scared or running). Pig penises are shaped like corkscrews and dart into the ground at a furious terrifying rate. They can chews gum like a human. Mickey once chewed a piece for 45 minutes without swallowing. They enjoy food like a human would; as Chris once said: "he would like a chip, but he would prefer a chip with dip". Mickey settled in nicely at the house, with a little bed, a litterbox and a whole main floor to discover. I went to bed that night and had nightmare after nightmare about the reality of what i'd done. Vietnamese Pot-bellied pigs were introduced to Canada in the early 80s as household pets. Smarter than dogs and very clean, pot-bellied pigs are unique pets with special needs, that with the right care can live a very happy life indoors. I would like to re-write that according to my experience. 1. Pigs are very intelligent. More intelligent than dogs even. Intelligent enough to know that sitting inside for a few hours a day, or even a backyard enclosure is not stimulating enough. Boredom sets in, as does mischief. Mischief involves: pulling up every little fibre on the carpet, knocking all the cushions off the couch, chewing on the table leg or pulling plaster off the wall. If you think having an inside pig is crazy (it is), you can make him a nice home in the backyard. I did, but it also wasn't perfect. He got out, no matter what fence I put up, he is that smart. Expect to spend your evenings searching surrounding properties for your pig and wondering what you have gotten yourself into. 2. Pigs can be litter box trained. They can be litter box trained quite easily, on the first day as a matter of fact. However, they EAT cat litter like it's going out of style. You must use special pine litter and put it in a giant litter box (a child's plastic pool works well) to accommodate the size of your growing pig. They also like to drag all the pine shavings all over the room, and into their clean blankets where they sleep, which makes the entire room an embarrassing mess. Pig owners quickly realize their pigs must learn to go outside like all other animals. 3. Pigs are generally clean animals and odourless because they don't sweat. Their bodies are clean but their snouts are always covered in mud, leaves, or yogurt. Everything in your house at snout level will soon be covered in that as well. Your pants and your guests pants will get 'pig faced' by the dirty snout, and you will also become accustomed to a pigs' not so odourless gas. 4. Pigs are easily trainable. Your pig will learn quickly where to go to the bathroom and how to do tricks because they are very food motivated. Some pigs play toy pianos, dunk basketballs, jump through hoops, ride skateboards. Other pigs open the fridge, open the cupboards, knock over garbage cans, run away with purses, tear up books, eat make-up, and shake tables until everything on it comes crashing down. 5. Pot-bellied pigs stay small. Small compared to a 1000 lb hog, but not small enough to pick up, or put in a car, or do anything you can do with a dog or a cat. Pigs become housebound very easily at anywhere from 80-200 lbs. Micro-mini and teacup are new terms being thrown around, but are not a proper representation of their size. All potbellied pigs will get larger than you'd ever expect, about the size of a dog, but 3x as heavy. 6. Pigs make good friends for dogs. Pigs are a dogs natural enemy, and if they are left alone together, they will eventually fight. There have been many instances of dogs killing pot-bellied pigs in family homes. 7. You can put him on a leash, take him for walks, dress him up and take him to parties. If you spoil a pig he knows you're the weakest link. Eventually, he becomes aggressive, territorial, and demands to get his way at all times. This will cause attacks, biting of both you and strangers, and an inability to trust your pig with other people. He is not the cutest guest at a party. 8. Pot-bellied pigs are social animals. This is why they need other pigs to live with. Then they can create a hierarchy within their pig company rather than within your family. If the pig starts to think he is one of the family, he will decide to move his way up the ranks, by picking on the weakest link. Many families have one family member the pig decides to attack to show dominance. Pigs need to realize that their human family is not their pig family, and that can only be done by keeping them with other pigs. I encourage anyone who loves pigs to visit RASTA Animal Rescue and Sanctuary in Calgary - a by-donation-only charity (Rasta Website ). After rescuing over 50 former house pigs, some 'teacup designer' pigs (that grew to be over 100 lbs), RASTA is no longer able to rescue anymore. There is nowhere left for these guys to go. I am very sad to say that these wonderful animals are being abandoned on a regular basis due to this misinformation. Everything they do is natural for them to do. So the destruction and problems caused are not their fault, rather ours, for trying to convince ourselves they are something they are not. I had Mickey for 5 years, which, in retrospect, was 2 years too long. I knew he was not in the right environment for a long time, it just took a couple years to find the proper forever home for him. This spring I drove Mickey up to Wetaskewin Alberta to live as a permanent resident at FARRM/Potbelly Pig Rehoming Network where he is living happily outdoors, with many pig friends, and a woman who devotes her life to helping these guys. So I guess all I ask of you, the reader, is that the next time someone tells you: “I hear they make great pets” - is to share with them the thing about the corkscrew penises and the whole eating walls thing. great article. It should be posted on every designer pigs website. I rescue pigs and this is very, very good. Well done. Lots of head nodding and laughter! Everything you have writing is dead on! LOL! Everyone should read this article! It's nice to see pig owners reading, but I must find a way to have wannabe pig owners read it. Well put and HILARIOUS! My Hammy is almost 2 years old. Everything you said is right on! I lived out in the country when I first left home for college at 19. I could do anything I wanted! I wanted a pig!! (Potbellies had not been invented yet.) I rented a big house with 4 roommates on an acre in the outskirts of Gainesville, FL. I bought a cute pink baby Yorkshire from an ad in the local paper. The guy could not understand why I wanted the runt of the litter. Right away Carmine was a great pet. I used to take him on a rhinestone-studded red harness and collar to the local disco. (It was 1980) Carmine turned out to be a cuddle-baby dream pet. For about a year. Then he began to get really big and grow tusks and scare us both. Fortunately, my father had friends who had a farm. They took Carmine and he lived out his life as a still-spoiled stud piggy. I was lucky. I have 7 rescued pot bellied pigs. They were all once someone's pet. I love them, they all live in a great barn with lots of room to roam and they have their own space when they want it. But they are not for everyone, and that is the saddest part. I am turning them away weekly, the ones people keep insisting I adopt. This is super great. I'll be sharing it on our sites as many should read it as they educate themselves to the pet pig. I have 9 rescued pigs, and could easily have 90- or 900- I get calls from people who want to give theirs up every week. It takes a very dedicated animal lover to give a pet pig a quality life, and to enjoy doing it. i adore mine, but have to admit, they will drive most people crazy. Thank you, THANK YOU, for putting the truth out there about our amazing pets! WELL DONE INDEED! Thank you for writing this. I agree with it all. I have mud spots on nearly every wall, door jam, pieces of furniture, all pig height of course. And my yard.. don't even get me going there. But as long as you are willing to adapt YOUR life to a pig, and be late to work, you are golden. if you aren't, DON'T GET A PIG!! 4. three of our pigs are "teenagers" so we spend a fair amount of time competing in stare-down contests and practicing "move the pig"
Did I miss anything? LOL But at the end of the day I couldn't love those crazy brats more!! What a great account of what pigs are really like as house pets! They are amazing animals but people do them a disservice by misrepresenting them! There are so many homeless pigs these days and rescues are completely full. Teacup breeders are scam artists. To others: Please give the ages of your photographed pigs. Looking at youtube, I'm beginning to infer that few people show them after 3 months, which makes me very sad wondering about the fate of their pets. Caponsacchi: RE: "Are they're still sanctuaries that will take a pig for a fee? Or pig farms that will "board" your pig. (I sense that mini pigs are no longer the "craze" they were a couple of years ago. If they were, we'd see much more about vets and boarding services.)" Fantastic article and dead on. Having a pig as a pet is nothing like a dog or cat. Your article brought back many memories of when I got my first pot belly. I am now on my 2nd. Your story sounds a lot like mine. I wrote this, and was struggling with what to do for the past 2 years. I started working with a pig rescue in my province, and surrounded myself with people who lived in rural areas that have pigs. I finally found the right fit, someone who wanted a companion for their pig and lived in the country. I dropped Mickey off there 2 months ago, with the deal that I would sponsor him monthly. I went back last week and he was the happiest I've ever seen him. Didn't even really miss me, just ran around with all his new pig friends and proved to me that I made the best decision. I've decided that it is very unfair to keep a pig without other pigs. So my suggestion to you is that you find something similar in your area. The relief and joy that came with his new home, has helped me get over the loss I initially felt. I guess I am lucky. My Willy is the perfect baby. He is a bit over a year and yes I have the snout marks on the cabinets, but he sleeps with me every night, pees in a thing I bought that collects the pee and you drain it. He only poops outside. He can be a bit noisy when I am making his dinner, and I have lost weight because it is hard to rat around him as he can be pushy. But I am so glad I have him and can't imagine not having him as he is like my baby. They have a language they speak and really understand what you say to them, it is amazing. 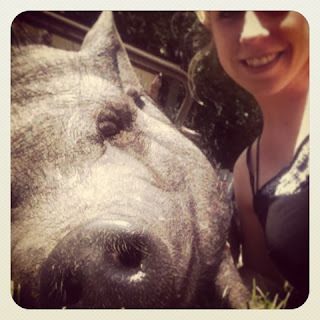 My pig will be 3 in October and I post pictures on fb of him all the time! The truth shall set you free! We have 3 piggies who we adore. They are truly family and live indoors and sleep with us as well. But I truly understand about family and friends not getting the equation. All my family and friends think we are nuts cause we have them. Upon getting our beloved pack we have decided to give up eating pork entirely. I have decided to give all animal products up as well. Proud vegan here and I owe it to our piggers. I have adopted two pigs from folks that got them young then could not provide for them as they became larger and more demanding. I LOVE LOVE LOVE my piggies! But being late for work is certainly not a myth. My pretty Miss Daisy grabbed the cat litter bag ripped it open and ran all about the house just minutes before I was set to leave for work. I keep the vacuum cleaner in front of the fridge as she is scared of it so keeps her from opening and emptying it of its contents. Lower cabinets are for non food items only. Food items seen atop a table or cabinet will be gotten down. Pigs are strong, smart, and determined. In spite of all the quirks, I would not trade them for anything. I get immense joy seeing them happy as they roam, root and graze. I love cuddling with them in the evenings and taking them to the lake for some world class wallowing on warm days, we have a van with a pig ramp...way too big to lift! If one is not capable of providing a pig with the life it deserves, please, just don't get a pig. Also a very proud vegan..though prior to the pigs joining the family. What a great article! IT reminded me of my experience with my first indoor pig. I was even smug, thinking, "this will be a piece of cake!" HAHA! However, I had my first indoor potbelly (Maggie) for her whole life, and we now have another, Gus Gus. Although they are difficult, nothing puts a smile on my face like my piggies! I hear ya sister! I have 3 pigs, Harvey is 5 also. I've tried to tell potential pig owners of the struggles and commitment needed but some just don't listen. It's like owning some sort of designer purse or something...a crazy status symbol or interesting conversation piece. 10 years ago we had as many as 24 pigs, all but 3 were abandoned by the previous owners because they outgrew their cuteness. I really wish people would stop giving misinformation, stop breeding unless you can accept and properly take care of "returns". I love my Harvey and his 2.5 year old sisters Holly and Olive, but I knew what I was getting into...so many don't. We are now struggling to find a house to live in because we can't buy in the city and our funds won't allow for much. Meanwhile my indoor piggies are outside in the Wisconsin weather and I cry every day. I miss constantly yelling "get out of the cupboard" and putting locks on everything multiple times because they figure out how to open them. It will happen again soon...I hope. For those who are considering a pig...ASK OTHERS WHO HAVE ONE...AND LISTEN. WE LOVE OUR PIGS BUT YOU NEED TO KNOW WHAT WORK THEY REALLY ARE. PLEASE, DON'T ABANDON THEM. DON'T BELIEVE THEY WILL STAY AS SMALL AS THE BREEDER TELLS YOU. Harvey is over 225 pounds and can toss a couch like it's a toy. Holly and Olive are over 100 pounds. Yes, that's mini as compared to a farm pig, but they still take up an entir couch and don't care if you're already relaxing on it...or if you ever want to get up! My husband and I have been talking about getting a pet pig for years-- will definitely stick to dogs after reading this. Thank you for the honesty! I agree with some things in this article but definitely not everything such as it basically implies to give up on pot belly pig owner ship. I have two pot belly pigs they were not fixed very young. My male has never once humped anything or been aggressive or had his thing out at all. They are both very sweet and submissive a dog could be scratching them and they wouldn't even fight back or bite. They were both very easy to train and better than any puppy I've every had which I have raised around 20 dogs. They have accidents and they have been destructive at times when left alone causing around $20 worth of damage. This is nothing compared to the puppies I've had chewing up hundreds of dollars worth of stuff. Dogs too are destructive and will eat through dry wall, some dogs get just as big or bigger than these pigs. So if you want to tell everyone to basically give up on owning pigs you should also let large dog owners they need to give up as well. It all depends on the devotion and love of the caregiver. If there is none there then I do suppose giving up is the best option. I am an "accidental" new pig mom. Maxwell came to us from a friend of a friend who decided they were going to slaughter him at 5 months old because he wasn't "new and shiny" any more. Honestly, I had no idea what I was in for. The first day, bruises and tears in my pants because of him jumping. Next day his blood curdling screams because we tried to put a harness on him. I'm realizing he's going to be quite a challenge, but I'm willing to adapt and work with him because I immediately fell in love and I'm all the poor boy has. Thank you for this article. I adopted a spayed female PBP from a rescue. She is very sweet and affectionate. She lives outside in a pen with a big house and a pool. She sometimes urinates in her pool. I'm not sure why she does this or what to do about it. Anyone have this issue? We've had Lewis in our home since he was a month old. He's now past the age of 4 and yes, he does weigh over 100 lbs (he weighed 2 lbs. when we got him) but he is a treasured member of our family and there are very few downsides with Lewis. We do get the snout marks low on the walls and scratches on our floors, he gets his hooves and snout muddy from rooting while out in the yard when it's wet. He makes some noise before feeding time. He's not easily transportable when going to the vet and such. That's about it for the downsides. I can't begin to name all the upsides: extremely intelligent, loving, loyal, cuddly, compassionate, communicative, intriguing, adorable, completely housebroken almost from day 1 - he's a lifetime companion. I wish people saw the value in holding onto their pigs, they are unique and special animals and no pig deserves to be abandoned. Finally some real facts instead of how terrific it is to own a house pig. Your article really woke me up I'm so glad I read it I've been searching for a reputable farm to purchase a mini, but now after reading your article I don't think a mini pig is for me thank you so much! I contact Dr.Agbazara when i had of him and This was even faster than I could dream of. Thank you for taking time to listen to me and answering all my emails Dr.Agbazara. I feel emotional strong again. My confidence is back and I can see my future clearly now. I am forever grateful for your help in re-uniting me with my lover who divorced and left me years ago for another woman. you will see for your self what am saying when you contact this great spell caster called Dr.Agbazara on for any help at: ( agbazara@gmail.com ) OR call or add on WHATSAPP: +2348104102662 ) and get your problems solved. Thank you for posting your experience and advice about pot bellied pigs. I've always suspected the truth, which is why I've never bought one of these creatures. I've seen others make the same mistakes as most trend followers. My field of experience is in rescuing parrots and hedgehogs. They also suffer from the same problems and erroneous expectations by their owners. Here's hoping that people will stop looking for unique experiences at the expense of innocent animals. I just have to say 2 1/2 years ago i got my little Chloe. She is my daughter. Pigs are life changing. For me it's all for the better. She is pretty heavy now. She could have grown to be 500 lbs and i wouldn't give this girl up. My girls make me smile everyday! I just have to say my Petunia is a wonderful smart loving girl. Shes three this year and around 350 lbs. She only lives indoors in the winter cause she prefers to be outside any other time. People hate that she gets them muddy but I don't mind at all, shes wonderful. I would not of thought a pig could bring this much joy into my life. There is so much trusty in this article, but having a pig can also be a very rewarding experience. I’ve had my Jilly for six and a half years now and she is 75lbe, doesn’t get into any mischief (I leave her loose in the house when I’m at work), is very friendly, and sleeps with me at night. They are definitely not for everyone but if they are right for you they truly are the best pet you could ask for! She has changed my life for the better and I love her more than words can say. I also have a cat and a dog and everyone gets along famously. I actually disagree, I don't know if we have just had great luck with our pot-bellied little baby, or if it's because she's a different kind of pot-bellied piggy. We adopted a genuine miniature Juliana Pot-Bellied piggy, when she is completely full grown, she will only be about 25 lbs, and she is absolutely wonderful!! Sure she snorts at us and roots around here and there, but she has never torn anything up, she was EXTREMELY easy to train to go potty outside, and also does great when being left with my Daschund for 9 hours a day while we're at work, they absolutely adore each other and she is the sweetest girl no matter who comes around, she just loves all the attention from people. Also, we weren't well prepared for her at all, but she has done amazing, and has been everything we were told a mini pig would be. She has all kinds of toys, and gets treats during training time every day, and she has needed little to no discipline, she tries to get a little bossy here and there, but a quick finger point and a stern "No" always does the trick. I think it may be because most genuine mini pigs, are handled and socialized with people from birth, rather than kept in a pen then ripped from their mama all of a sudden, squealing like crazy, and completely terrified. Our little one immediately bonded with me and slept on me the whole car ride home and has followed me around ever since. By the sounds of things, I think people are having these issues because they're A)getting dooped by a breeder that says they have mini pigs and they're not or B)they think they can handle a genuine pot-bellied pig, but don't do the proper research to make sure they're making the right choice. I only recommend where we went for our piggy because we got to meet her whole family before we took her home, and all of the piglets were extremely social and friendly. Not only that we got to see all of the parent piggies, and the largest was maybe 45lb and that's pushing it. People need to think about why their piggies are so traumatized and need so much time to stop being scared, breeders should be doing more to socialize their piggies, and get them ready for their new homes, rather than creating the perfect storm for you and your new baby. I wish all breeders gave the same care that Pepper had, maybe more people could keep and handle their piggies. Placed over a rubber mat. This worked great! which she most definitely is! All the time! She is very vocal! I love having a pig! !